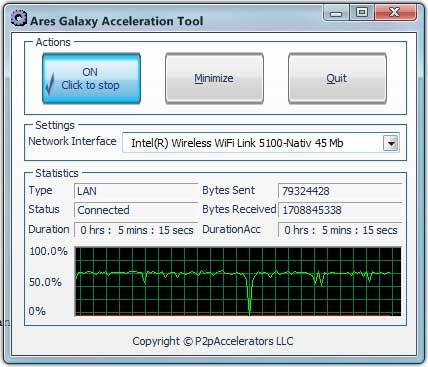 Ares Galaxy Acceleration Tool is an innovative traffic accelerator for Ares P2P. ...... The sophisticated acceleration algorithm stays behind a simple and friendly interface which doesn't require much user action. Ares for Windows Vista is the latest version of the p2p program Ares. Ares Galaxy Professional Edition is a free peer to peer file sharing program. A high-end module for LimeWire file sharing application. The 9Squares is a fun arcade-style puzzle game for Windows. Tetris-like game. An effective plug-in for BitComet P2P,increase speed of BitComet downloads. Qweas is providing links to Ares Galaxy Acceleration Tool 3.3.7.0 as a courtesy, and makes no representations regarding Ares Galaxy Acceleration Tool or any other applications or any information related thereto. Any questions, complaints or claims regarding this application Ares Galaxy Acceleration Tool 3.3.7.0 must be directed to the appropriate software vendor. You may click the publisher link of Ares Galaxy Acceleration Tool on the top of this page to get more details about the vendor.